While the nation celebrated the launch of PSLV-C40 on Friday, the 40th successful mission involving the Polar Satellite Launch Vehicle, ISRO scientists were learning lessons from the failure of PSLV-C39 on August 31, 2017. A failure analysis, details of which were shared with TOI, has found the Pyro devices (that trigger a small, controlled explosion to snap some parts) in the rocket's heat shield had malfunctioned. The detonation of the devices was to break the rivets linking the two halves of the heat shield encasing the satellite. Due to this malfunction, the shield remained intact, keeping the navigation satellite IRNSS-1H within. Director of Vikram Sarabhai Space Centre and ISRO chairman-designate K Sivan, who chaired the failure analysis committee, said a rubber bellow between the two vertical halves of the heat shield was supposed to expand with the gas pressure generated by the ignition of the Pyro devices. The explosion was to detach the two parts of the heat shield. "In this case, the pressure generated was not enough for the bellow to expand and trigger the separation," said Sivan. The heat shield protects satellites they carry from atmospheric temperature generated due to friction as the rocket moves in the earth's atmosphere. The nose cone provides smooth aerodynamics for the rocket. 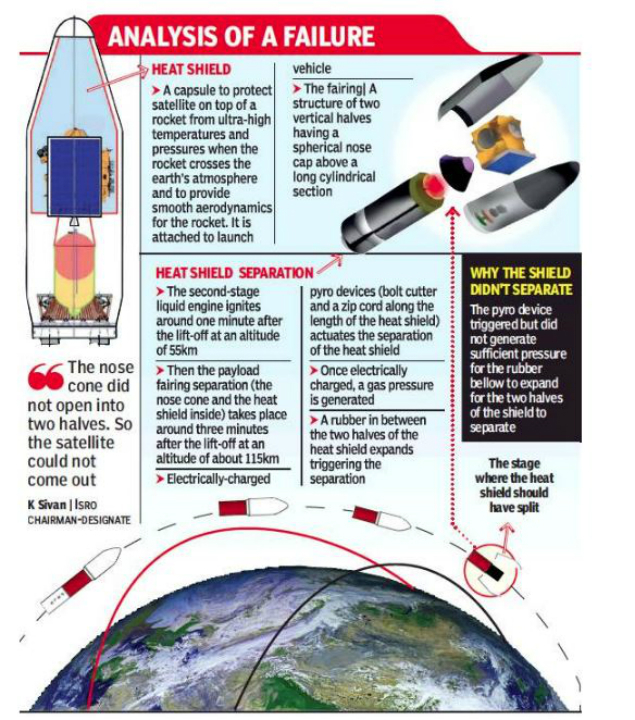 "Once the vehicle crosses the earth's atmosphere, the heat shield is not required, and it has to be separated from the vehicle," said PSLV project director R Hutton. Sivan said while the command for separation had gone through, it failed to trigger the mechanical process that pops open the heat shield. "The heat shield should separate in two places - from the launch vehicle below and then split into two halves. In this case, the nose cone detached from the rocket, but did not open into two halves till the end of the mission," he said. "The satellite is still in orbit with the heat shield." ISRO Chairman A S Kiran Kumar earlier said that uneven pressure distribution around the rocket was also one of the reasons for the failure.